Video clip synopsis – In the 1930s Nancy Bird Walton became known as the "Angel of the Desert", working with the Royal Flying Doctor Service. Some tried to discourage a woman flying on her own in the turbulent conditions of the outback. Broadband MP4 bird_bb.mp4 (9.7MB), suitable for iPods and computer downloads. She Wanted To Fly is an excerpt from the program Nancy Bird Walton (26 mins), an episode of Australian Biography Series 1 (7 × 26 mins), produced in 1991. Nancy Bird Walton: A fully qualified pilot by the age of 19, Nancy Bird Walton went from being the youngest commercial licensed woman pilot in the British Commonwealth to becoming Australia’s “First Lady of Aviation” in the 1970s. She became known as “Angel of the Outback” for her work with the Royal Flying Doctor Service and received an OBE in 1966. In 1977 she became a Dame of St John (Knights of Malta). Nancy Bird Walton was born in Sydney in 1915. She wanted to fly from an early age, and was known for climbing onto fences and declaring herself to be an 'eppy plane’. She flew for the first time at an air pageant, at the age of 13, paying the pilot extra to perform aerobatics. At 18 she was learning to fly, under the tuition of no less than Charles Kingsford-Smith. Nancy was among the first of his pupils at his Sydney flying school, even though she needed cushions to reach the rudder pedals. Nancy had no intention of flying just for a bit of sport, which was a common motivation among women pilots at the time. It was to earn a living. She became the first woman pilot in the Commonwealth to achieve commercial certification to carry passengers. Her family bought her first aircraft, a De Havilland Gipsy Moth. Nancy and a friend, Peggy, set off on a tour, barnstorming and giving joy rides at country shows where many people had never seen an aircraft, let alone a woman pilot. On tour, she met Rev. 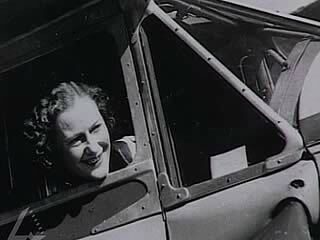 Stanley Drummond, who persuaded her to join a flying medical service in outback Australia. With a better equipped aircraft she worked territory not previously covered by the Flying Doctor Service in remote parts of New South Wales. In 1936 Nancy won the Ladies’ Trophy in the Adelaide-Brisbane Air Race. After four years in the outback, she took a break, accepting an offer from a Dutch airline to do promotional work. She returned to Australia just before World War 2 began and undertook training women to back up the men flying in the RAAF. In 1950 Nancy founded the AWPA (Australian Women Pilots Association). The AWPA celebrated its 50th anniversary in October 2000 with a dinner at a restaurant near Adelaide, South Australia, attended by Nancy herself and sixty or so pilots in powered flight, gliding, ballooning — with hardly a man present. In 1966 she was awarded the Order of the British Empire. What did Nancy Bird Walton achieve? What might have been her possible motivations? What values or beliefs affected her actions? How did Nancy Bird Walton affect the lives of other Australians? Why do you think Nancy Bird Walton was a subject for the series Australian biography? Investigate the development of the Construct a timeline exemplifying significant events and the contribution of people to the development of the Aviation industry in Australia, for example contributions of people such as Charles Kingsford Smith, the founding of businesses and organisation like QANTAS, Flying Doctor Service and Australian Women Pilots’ Association.